What activities are being organised this year? At the end of the activity, the ECA provider will bring the children to their usual collection point (Junior yard for Junior and Senior Infants & Senior yard for 1st - 5th class). If your child is attending Explorers, please specify this when registering your child. What is the Term Duration? : Please see above table for exact dates. What is the cost? : Please see above table for class fees. What is the '1:10 Club'? : The 1:10 Club has been a great success since it started this year. Sabrina and Sinead are the supervisors of the 1:10 Club. The children will be collected by Sabrina and Sinead from their teachers at the Infant Yard at 13:10. At the start of the class, children will be given a small snack consisting of crackers or rice cakes, and a small piece of fruit. Alternatively, you can provide your child with a snack which should be placed in a separate container to their school lunch. Please let us know if you have any concerns regarding this. The children will then enjoy some time playing and colouring in the classroom, reading in the library and where applicable, can do their written homework. We are sure your little ones will have a fun time! Collection will take place at 14:10 in the infant yard, same system as the normal school daily collection. The '1.10 Club' will be held every Monday, Tuesday, Thursday and Friday. 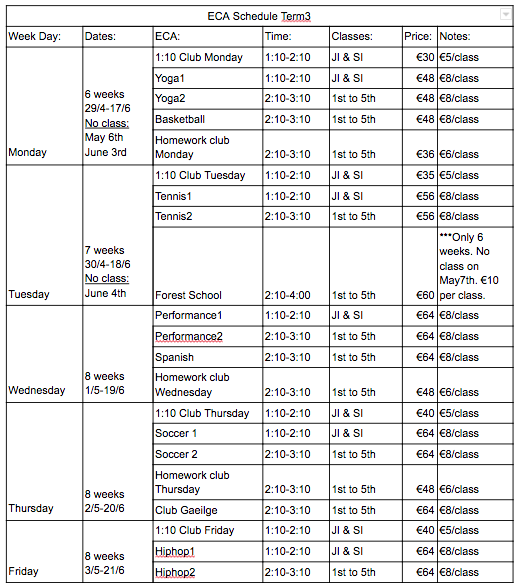 There will be a €5 charge per class per day and bookings will be for the full term of the extra curricular activities term. Parents can choose to sign up their child(ren) to attend either one, two, three or four days per week for the duration of the term. How do I book an ECA place? : All Extra-Curricular Activities are booked and paid online, using a secure PayPal system or Aladdin. All children enrolled in the first term will be offered the chance to re-book a place in the same activities for the second term, and the same for the third term. Please note the school vacancies after re-enrolment will be available to book using the link to the registration portal that will be emailed from the school. Early booking is recommended to avoid disappointment. Places are allocated on a first come, first served basis. We can only accept bookings that use our online portal for payment. We regret that cash payments will not be accepted. How does the booking site work? : You will be able to book places as soon as you receive the registration link and code from the school (Dec 5th@10am). You may add multiple activities into the cart for different children in the same transaction as long as places are available. Early booking is recommended to avoid disappointment. Activities will be held in your 'Cart' for 30 minutes or until the class is fully booked. Once the class is fully booked, your reservation will be gone, a place is only confirmed once it's paid for, so you need to checkout please. What can I do if I can’t get a place for my child(ren) in one of the activities? : You can send an email to pac@stepasideetns.ie. Please include in the email subject line, which activity waiting list you want to be added to. If a vacancy becomes available, we will contact parents in order of first come basis. Can you tell us a bit more about the classes and the teachers please? Michelle will continue teaching Yoga to our students this year. Michelle is a Senior Paediatric Occupational Therapist and Certified Kids Yoga Teacher, who has been working with children for nearly 10 years and has an extensive understanding of children’s development. In her yoga classes, the students will join her to stretch, strengthen and learn yoga poses by transforming into animals, telling stories and playing games, all while breathing and having fun!! Teaching kids’ yoga from an early age has endless benefits for their bodies and minds that will not only help them grow and stay active while they are children, but they will also learn skills that will stay with them for life! Join the teachers from Elite Dance Academy, Belarmine for some after school singing, dancing and acting fun! Our one hour classes held by our experienced teachers will allow the children to explore the arts and build their confidence. ● Gillian our drama teacher, who has not only produced but performed in many productions including Matilda the Musical & Shrek the musical most recently, is an expert in guiding young children in exploring their own imagination. Taking them away on magic adventures without ever leaving the classroom! With the older children, Gillian will show them the true meaning of drama and allow them to find and embrace their inner actor. ● Krystyn our dance teacher has been dancing before she could walk. Currently running Elite Dance Academy, Belarmine she has performed on stages across the nation but now focuses her talents locally. Trained in a number of disciplines, these classes will mainly focus on hip hop. Working with tots right up to adults, her dance classes will include learning correct technique, choreography and stretching. Krystyn is excellent at bringing children out of their comfort zone and giving them the tools they need to confidently dance, whether on their own or in front of a room full of people. In these classes, younger children can rock out to their favorite songs while older children can get down to work and learn some cool new tricks! ● Karen is our stage production teacher. Along with being a celebrated choreographer, Karen has excelled in stage production. While learning dancing and drama is important, what’s even more important is learning how to put it all together and present it to the best of the children’s ability on stage. Karen is a master at bringing out a child’s greatest abilities and making each child shine individually on stage. We are delighted to introduce Stephen Flynn as our new soccer trainer. This is a new class organised for this year and we are delighted to have it led by our teachers Michael (Stepping Stones) assisted by Damien (Junior Infants). Michael played basketball at school along with other ball sports and will be teaching a basketball class this term. Children will learn the basics of the non-contact sport and improve their fitness in a fun environment. He will focus on everything from shooting form, lay ups, foot work, ball handling, dribbling and passing as well as athletic and movement skills. A very popular class for the last few years in our school. The class is taught by Sarah Denis who is a fully qualified RAD & ISTD teacher and has taught Ballet, Jazz Ballet & Hip Hop for many years across numerous schools in Dublin. The class will include routines from the current charts and also some musical theater numbers. It is a fun and active class suitable for anyone interested in performing arts or dance! Please note that the end of year show will be held in the school hall this year. Padraig, our school teacher, is offering this new activity where kids can get help with their homework. Damien, our school teacher, is offering this new activity where kids can have loads of fun and games while practicing their Irish, every Thursday at 2:10. The class will be facilitated by Heather Burnett Niland, from www.forestkidsfun.net, whose background is childcare and the outdoors. The class will be held in any weather except if there is a weather warning in place. In order to take part, children need to be appropriately dressed, that is, waterproof jacket and trousers, hiking boots or wellies, hat and gloves. Children without the appropriate outfit will not be able to take part and parents will be rang and asked to collect them as soon as possible. Children can bring their outdoor boots and gear in on the morning of the adventure in an extra bag. They’ll change in their class and leave their rucksacks in the school. The kids will then be walked up to Fernhill with no bags which will make their adventure more enjoyable for them. They will spend an hour exploring and learning in Fernhill. They will return to school where they can pick up their school bags. Pick up time is 4pm. Any children who have a designated S.N.A. will need an adult with them.